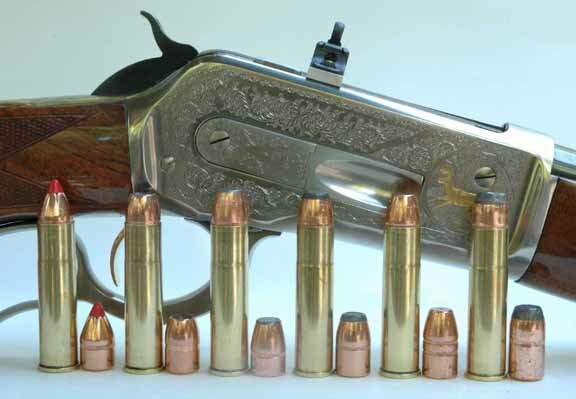 .458-inch bullets and create a powerful big game cartridge for use in lever-action rifles. He called it the .450 Alaskan, and it had a powder capacity slightly greater than that of the .458 Winchester Magnum, which enabled the big cartridge to exceed 2,000 fps with a bullet weighing 400 grains at a chamber pressure level easily handled by two rifles: the smokeless powder version of the Winchester Model 1886 and the Winchester Model 71. Alaska bear guides found the big cartridge to be just the ticket for preventing their clientele from being mauled by a hungry bear or gored by a bull moose in rut. Then came a .50 caliber version of the same cartridge. As the story goes, Johnson acquired a Winchester Model 86 in .50-110 with a bad barrel and decided to make a replacement for it from a military-surplus machine gun barrel in .50 BMG. But rather than chamber the new barrel for the Winchester cartridge, he necked up the .450 Alaskan case to .50 caliber. The latest version of this cartridge is the .50 B&M Alaskan, which was named for its developers, William Bruton and Michael McCourry. Both are fans of big holes through rifle barrels, and their cartridges of various calibers have given them plenty of excuses to head to Africa on a number of occasions for bullet-testing excursions on elephant, Cape buffalo, hippo and such. Developed for lever-action rifles, the .50 B&M Alaskan case is formed by slightly necking the down Starline .50 Alaskan case so bullets made for the .500 S&W Magnum can be used. A rifling twist rate as slow as 1:20 will stabilize the heaviest of .500 S&W Magnum bullets. An abundance of readily available .500-inch bullets in weights ranging from 275 to 500 grains gives it a practical edge over the original .50 Alaskan and its .510-inch bullet. In addition, molds are available from Lyman, RCBS, Redding and NEI for casting lead bullets of various weights. Reloading dies are available from RCBS and Hornady. It should be noted that at .50 B&M Alaskan impact velocities some of the .500 S&W Magnum bullets are too soft for use on the larger game animals, especially inside 50 yards where velocities are still high. Most would likely work fine on deer, but for bears weighing much over 300 pounds as well as moose and elk, a stout bullet is in order. McCourry has found the 500-grain Hornady at 1,800 to 1,900 fps and a custom SSK 425-grain all-copper hollow-nose bullet at the same velocity to be deadly on game as large as eland and giraffe, with excellent penetration and weight retention. I'm thinking either would work on any game animal in North America, and that includes grizzly out to 125 paces or so, but the ultimate bear medicine for this cartridge may be the upcoming 450-grain bonded-core bullet designed by McCourry and made by North Fork Bullets. For deer-size game, McCourry likes the 400-grain Sierra Sports Master at 2,000 fps and the 300-grain Hornady FTX at 2,100 fps. Overall cartridge length with the FTX bullet is too long for the Marlin, a problem easily solved by slightly shortening the case. That bullet works fine in the Model 71 with a full-length case. As powders go, IMR-4198, Reloder 7 and Reloder 10X have proven to be some of the better choices. Recoil? Yes, there is some. For my Marlin 1895 in .45-70 I load 300- and 400-grain bullets to respective velocities of 2,100 fps and 1,900 fps and as is to be expected, recoil feels about the same as with those bullet weights loaded to the same velocities in the .50 B&M Alaskan. Push a 500-grain bullet to 1,800 fps in the .50, and while you know you are not shooting a .45-70, the recoil will likely go unnoticed on a rainy Alaska day with a big grizzly at 30 paces and closing fast. McCourry says the Marlin Guide Gun is not a good candidate for the conversion because excessive drop in its straight-grip stock makes it less comfortable to shoot than Model 1895 variations with curved grips. I'm thinking the Model 1895XLR with its stainless steel barreled action and laminated wood stock is the ideal candidate for the conversion. In a carbine this cartridge would be just the thing for a bear guide or for the fisherman who needs protection in bear country. For my own use I would prefer a 22-inch barrel. A bit more barrel out front would dampen muzzle climb a bit and also put muzzle blast farther from the ears. I'm thinking the longer tube would increase velocity by 75 to 100 fps.